When I first began planning my trip to Southeast Asia, I was going to do it all on my own; make all my own arrangements for transportation, book all my own hotels, and figure out all the best stuff to see using my good friend Google. I was going to start in Vietnam, and then spend some time in Thailand. But, the more I tried to plan, the more stressed out I got about tackling Vietnam on my own — especially considering it would be my first time traveling solo in Southeast Asia. Vietnam is not quite as developed as Thailand; there IS tourism infrastructure there, but it isn't quite as easy to navigate as Thailand. In the end, I decided that the stress of going solo in Vietnam might make it hard for me to truly enjoy the experience. And so I decided to look at other options. I've worked with Intrepid Travel in the past (in Eastern Europe, in Central America, and in the Greek Islands), and so I began browsing their offerings in Southeast Asia. This is actually where the company began operating tours 25 years ago, and so I knew whatever I found would be top-notch. Twenty-five years, after all, is a lot of time to practice and make improvements. Originally, I was only going to visit Vietnam and Thailand. But then I stumbled upon a tour encompassing both Vietnam and Cambodia that ended in Bangkok, Thailand — “The Best of Vietnam and Cambodia.” It sounded perfect, and I told myself that NOT visiting Cambodia (and the Angkor Temples) while I was already in the area would be silly. So I got in touch with Intrepid, and within a few weeks was booked on a tour for the first couple of weeks of my Southeast Asia trip. My stress levels instantly lowered. 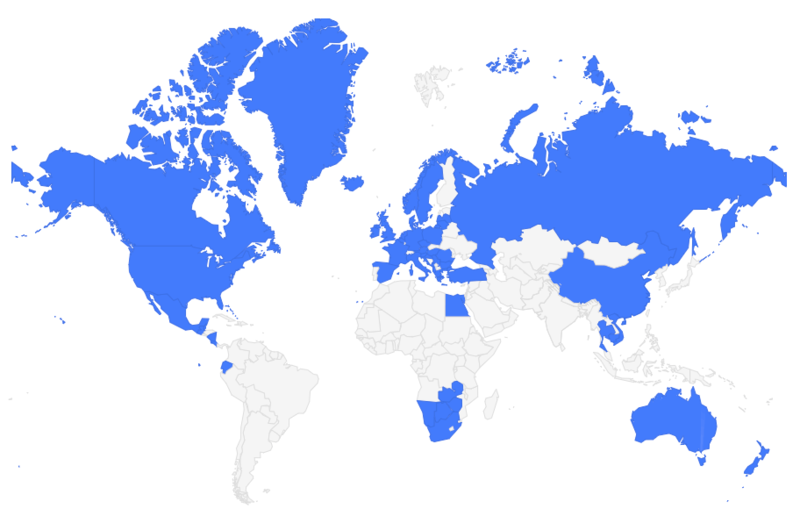 The tour, it turned out, was actually TWO tours connected in the middle — one in Vietnam and one in Cambodia. And so I've decided to review them separately, since I had two different guides and two somewhat different experiences. If you're wondering what to pack for a trip like this, check out my Southeast Asia packing list. Must-have items (in my opinion) include light layers, comfortable sandals, and a sleep sheet. Intrepid requires you to have travel insurance for the entirety of your trip. You may be covered under your regular insurance plan, but if you're not, I recommend buying coverage through World Nomads. They offer the most affordable basic travel insurance out there. 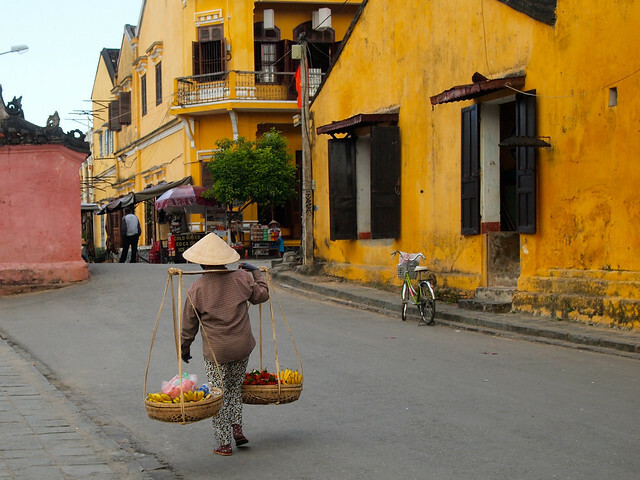 When visiting Vietnam, you likely will also need a visa. And a Vietnam visa is something you have to prepare for, by either getting it before you leave or applying to get a visa on arrival. Check out this info on getting a Vietnam visa for US citizens. 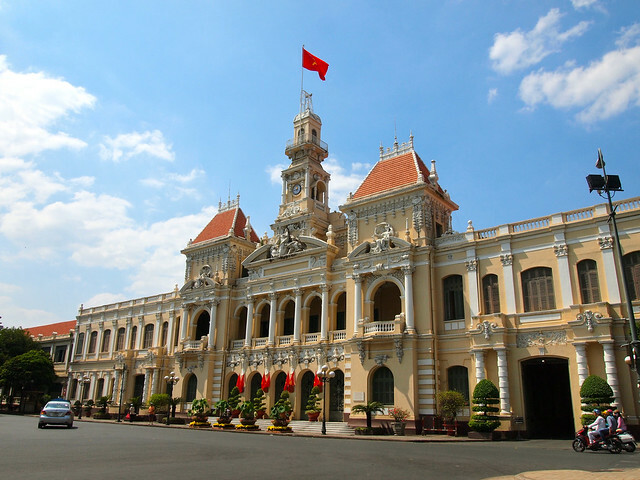 It walks you through the different options for obtaining your Vietnam visa. We also had opportunities to get out of the cities on half-day trips, usually visiting markets or cycling through the countryside. The travelers in my group hailed from Australia, the U.S., the UK, and Chile, with ages ranging from 20 to 60+. There was a family traveling together from England, young couples from Australia, and a handful of solo travelers, too. This is a pretty typical mix for an Intrepid group, in my experience. And, as always when traveling with Intrepid, our group was small — only 13 people. I've never had a “bad” group on an Intrepid tour; they have all been good for the most part. But this group? This one was especially fantastic. Despite the age differences and the fact that we all came from different parts of the world, we all got along ridiculously well. 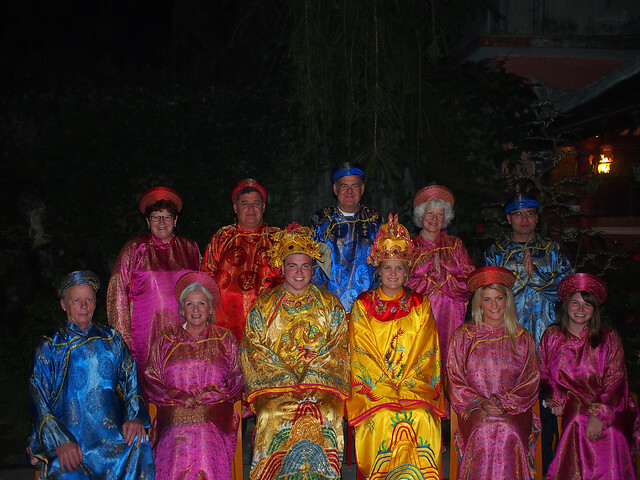 Everyone always seemed to be up for just about anything, whether it was singing karaoke on a boat in Ha Long Bay, dressing up like concubines in Hue, or going on death-defying bike tours in Hanoi. We had SO much fun, and the group definitely helped me enjoy the trip more. Our tour leader, a tiny, high-energy local by the name of Hai, was equally as fantastic. He was a great leader in the sense that he took care of all the little details of our trip flawlessly. We were never delayed, and we were always well-informed about where we were going and what we needed to bring (like breakfast on our overnight train ride, or something to cover up with for visiting temples in Hue). He was also incredibly knowledgable about Vietnam in general, and was almost always able to answer any questions we had. I also never felt like he was pressuring us to book optional extras or buy things at the various tourist stops we made. He was just a happy guy that you genuinely enjoyed being around, whether you were stuck on a train for 12 hours or laughing at his antics at a local club. It's so true that a guide can make or break a tour like this. In this instance, Hai absolutely made the trip, and I think everyone in the group would agree. We were spoiled by the fact that Hai knew so much and that he had such a fun personality. He also was very conscious about what Intrepid stands for as a tour company, which was quite refreshing. The majority of travel on this tour was done via private mini bus. This made the hours in-transit quite comfortable, and made it easy for all of us to chat and get to know one another. 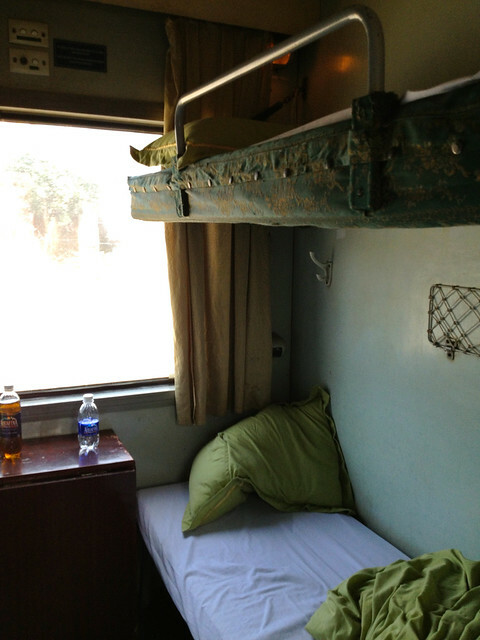 We also took one overnight train (from Hanoi to Hue) and one short flight (from Hoi An to Ho Chi Minh City). I will make a note for anyone planning to book this tour in the future that the local trains in Vietnam are definitely NOT fancy. We were booked into “first class” cabins, which meant 4 beds in each room. The train cars (and the sheets) were not particularly clean, and we may or may not have had some rodent residents in our train car… My advice is to just accept this as part of the adventure, and perhaps make sure you have a sleep sheet with you. This trip is an Intrepid Original style of trip, which means 2/3-star tourist class accommodation. If you are traveling solo, you’ll be sharing a room with at least one other person unless you pay the single supplement fee (which I did for this trip, since it was extremely affordable). I'm used to traveling this way — usually mid-range hotels that are not disgusting, but also not super fancy. On this tour, however, I think we were all quite impressed with the class of hotels we stayed in. None of them were huge chain hotels, but all were clean, comfortable, and usually came with free wifi. 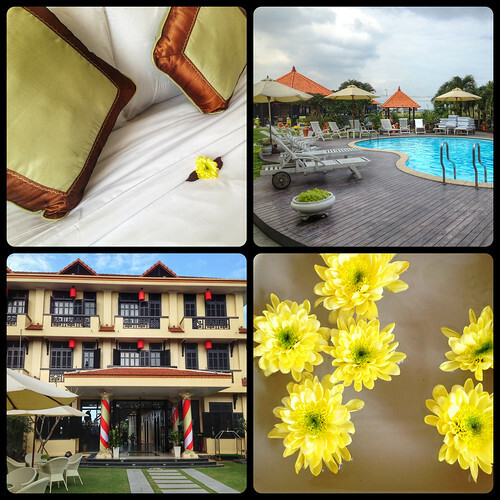 And some of them were downright beautiful, like the Phu Thinh Boutique Resort and Spa in Hoi An. Note that accommodations on this trip also include that overnight train mentioned above, as well as one night on a boat in Ha Long Bay. The “junk boat” we slept on in the Bay was far from junky, though — it was full of character with decent-sized rooms with ensuite toilets and showers. 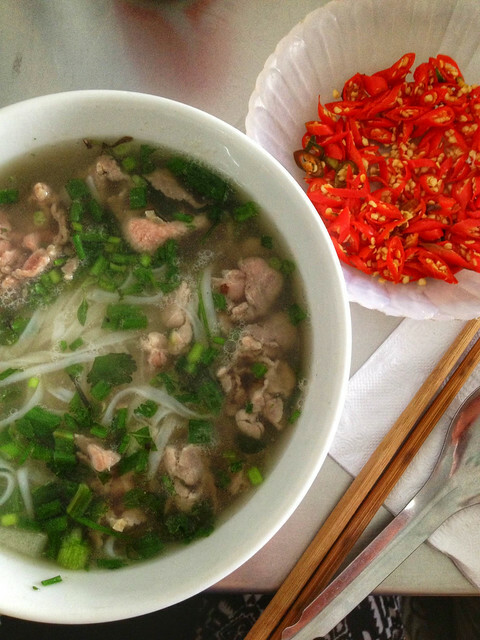 What will you eat in Vietnam? 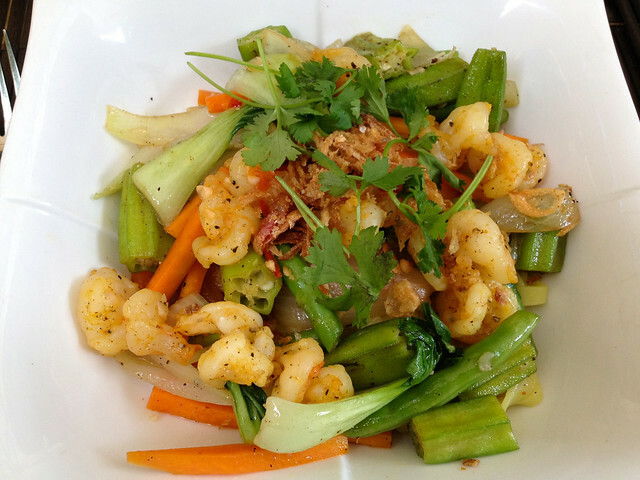 Traveling through Vietnam, you of course will eat lots of yummy Vietnamese food! Our tour leader was really good about offering to plan group dinners for us, or giving out personal recommendations on good places to eat if we wanted to do our own thing. He also would stop at roadside stands for us to have a quick lunch of pho (noodle soup) right alongside the locals. My favorite Vietnamese dishes included beef pho, spring rolls (especially the fresh ones), and Cao lầu (a regional specialty in Hoi An, pictured below). 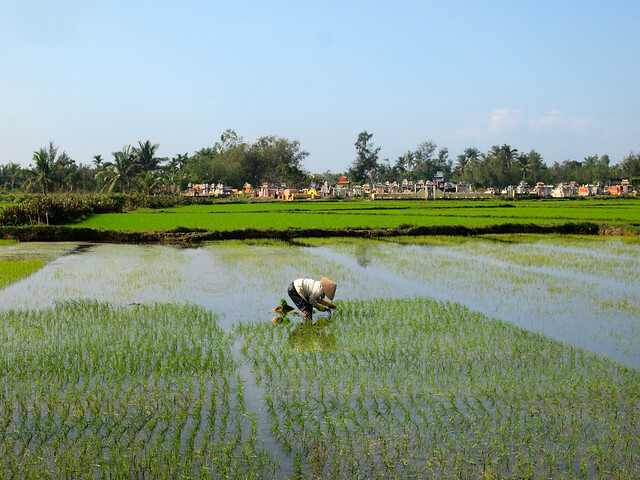 What will you do on this Vietnam tour? The optional activities were always just that — optional. However, our group generally signed up for anything and everything. Despite a fairly full schedule, we still found ourselves with a decent amount of free time. Usually we would either relax, or divide up into smaller groups to do things. I went to a local market with an Aussie couple in Hue, wandered around to see the sights with a small group of people in Ho Chi Minh City (like the Reunification Palace and all the Tet decorations), and even took a night off from the group to meet up with some friends in Hoi An. Overall, this was a really great tour. The only downsides I can think of are that it could be longer (another night in Hanoi and perhaps an extra one in Hoi An for people who want to get some things custom-tailored would be great) and the price could perhaps be raised in order to just include a lot of those “optional” activities. Those activities add up — it would probably feel like less of a strain on the wallet if more of them were just automatically included in the price of the trip, even if that meant raising the price $100 or so. Would I recommend this Vietnam tour? DEFINITELY. I loved this tour, my group, and Vietnam in general. Thanks to the mix of cities and countryside, I feel like I really got a good taste of the country. Having a local guide allowed me to understand Vietnam a lot better, and also have a lot of great local interactions that I know I probably wouldn't have had if I had been traveling solo. Overall, it's a trip that I have very fond memories from, and one that I would recommend to anyone wanting to visit Vietnam without having to worry about any of the details. In the end, this turned out to be the perfect introduction to Southeast Asia for me. 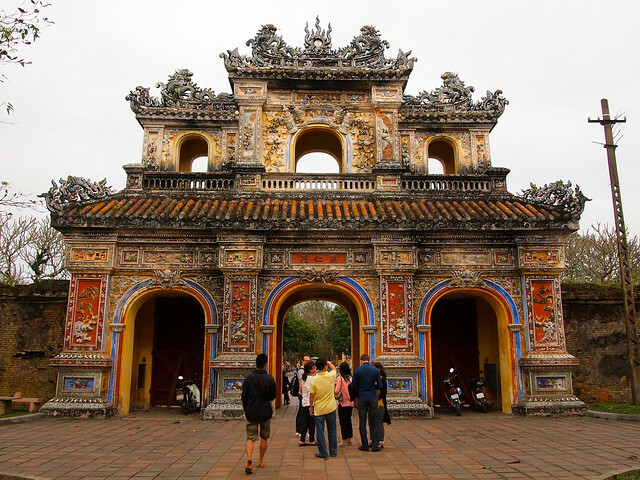 Book this Vietnam tour for yourself! Would you ever consider a tour like this in Vietnam? If you'd like to book this same tour, check it out here. *Note: I did receive a complimentary tour of Vietnam and Cambodia from Intrepid Travel. As always, though, opinions are completely my own. I’m a bit of a newbie to your site and wanted to say how much I enjoyed this post. I looked into going to Vietnam not so long ago and like you felt a little overwhelmed by it all so this tour seems like the perfect option…with seemingly no real compromise (I followed the links and the prices seem pretty reasonable too!). I know you have mentioned in the post that the optional excursions added up, I was just wondering if you could recall the pricing of the things you did as I can’t seem to find the specifics on the Intrepid Travel website? Looking forward to hearing about your experience in Cambodia. Hey Caity! I’m really glad that you found this post helpful. I really enjoyed the tour, and it helped me enjoy Vietnam a lot. As for the extras, food was usually cheap (most meals, even at “touristy” restaurants would usually only fun $4-$8 for dinner), with the exception of the banquet dinner, which I think was around $18. 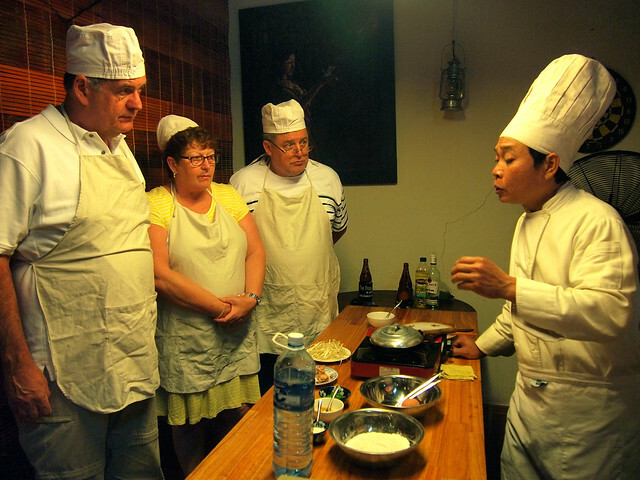 The cooking class in Hoi An (which included eating the food you made) was around $35. The bike tours ranged from $15-$25. The water puppet show was cheap, at just $7. 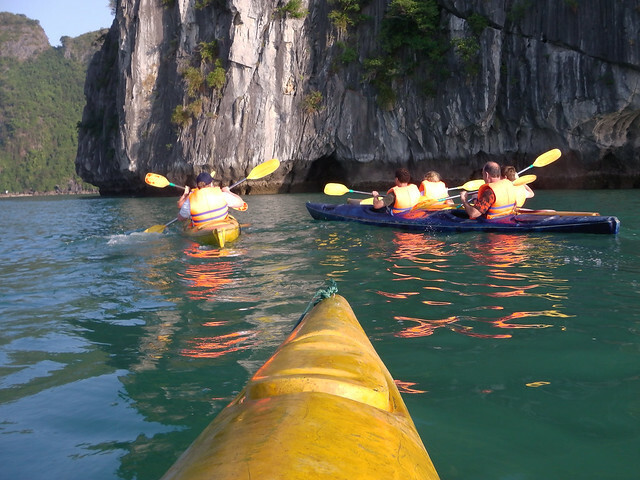 And the kayaking at Ha Long Bay was $11. Compared to prices in other parts of the world, these aren’t really all that expensive. But it’s useful to know about so you can bring some extra money! It sounds like you squeezed a lot into this visit, which is exactly how I like to travel too! At the end of the trip, we were all amazed by how much we had seen/done! I have actually looked at this tour, a few times for next year, not really sure when yet. Or how I’m going to do what I want to. My sister lives in Cambodia so I want to visit her and then travel around. I’ll work it out when I’ve saved more. Ohmygosh kayaking in Ha Long Bay- I don’t know if you’ve ever seen Top Gear but they visited Vietnam and did a race across the country on mopeds & ever since then I’ve wanted to go to Vietnam. Eww rodents. I think my shoes would be staying on. YES I’ve seen that Top Gear episode! My boyfriend and I actually re-watched it before I left to get me pumped up. 🙂 I can tell you that Vietnam is just as great in real life as it looked on TV! 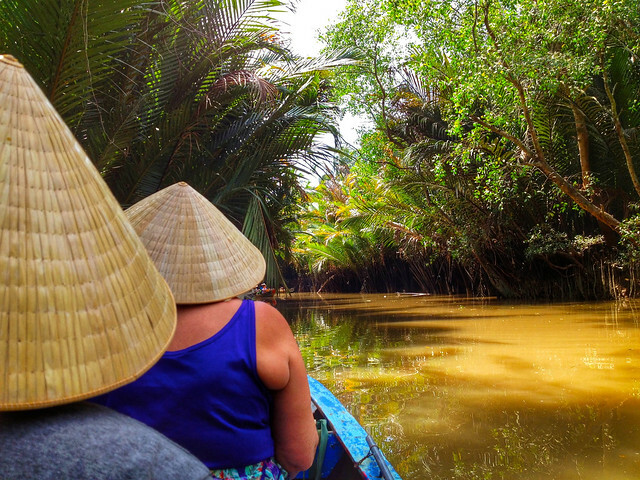 This is definitely a good way to see Vietnam (and at quite an affordable rate, too, I think), especially if you were already going to that part of the world to see your sister in Cambodia. Would like to give SE Asia a second chance, as Thailand disapponted. Too touristy or too hippy dippy druggies who despised us being ‘tourists’. Our guide was fantastic, but the one rogue member of our party (it only takes one) had a negative impact on all of us. There were other issues with the tour too, none of us thought that the company (G Adventures) we travelled with took seriously. Sorry to hear that, Coral! I would definitely recommend giving SE Asia another try. Get out of the touristy parts of Thailand, and I’m sure you would have a very different experience! This is so helpful for me – thank you! 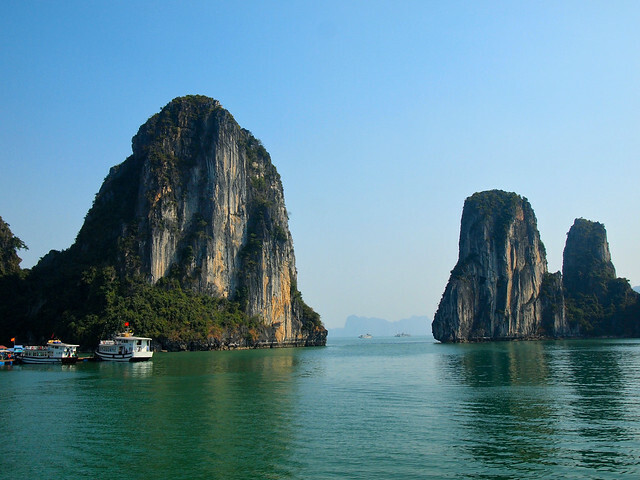 I’m busy stressing/researching/planning for mt trip to Vietnam this summer…can’t wait! So glad you found it helpful, Lisa! I haven’t been to SE Asia yet but I think you were right; a tour is a good way to visit for the first time in an area like this. I would probably consider a trip to Vietnam due to the tour; sounds like you had a great time and didn’t have to worry about being overwhelmed while planning all yourself. Great post! I think if I had gone to Thailand first, I would have been a little more confident in figuring things out on my own. But I’m definitely glad that I went with this option! Liked this info. My boyfriend and I did Thailand, Vietnam and Cambodia on our own last year and had a ball. Many of your photos look like copies of mine! We travel on our own, ie no packaged tours with the exception of day trips once in a while, which we believe saves us a good bit. Of course, our accommodations are pretty basic usually, but who cares. 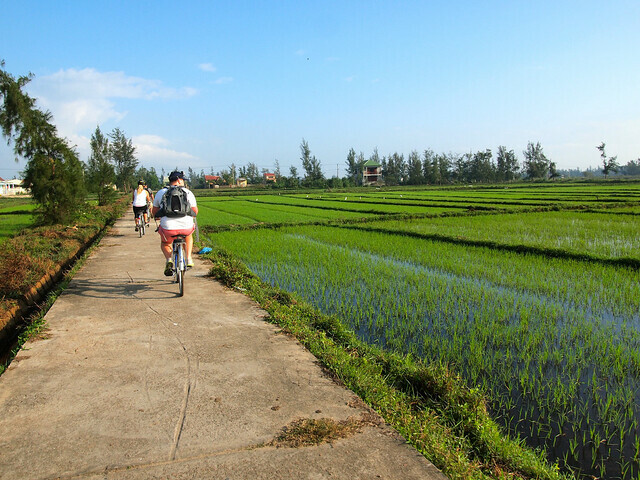 I would recommend Vietnam to anyone with an ounce of adventurous spirit. Yeah, it can get a little dodgy at times (you’re spot on with the trains – whew!) but with the right attitude, it’s fantastic. Cambodia… what can I say? We loved it. Boyfriend had been before and told me I’d fall for it and he was right. We’ll definitely go back one day. Great to hear, Becky! In the end, I was glad to have been with a group in Vietnam and Cambodia – it definitely helped me enjoy both countries more, I think. I’m not sure I would have had as much fun completely on my own! It really sounds like a great tour Amanda and I love your video, makes me want to go now! I’ve used Intrepid before in Cambodia and thought they were great. I especially love that we had a local guide who could give really good recommendations on places to eat and see. Having a local guide can really make the experience different! So glad to hear you liked the video – I had fun making that one. I can totally understand the tour got your stress levels down and I’m happy that it turned out to be great. I’ve been to Vietnam twice – in 1990 we couldn’t get permit to leave Saigon – so I went back in 2004. I’d say it’s quite a lot easier to travel solo in compared to Thailand, thought the travel is slower because the infrastructure still hasn’t recovered from the war – we did do some internal flights because of that. We found that hotels handed us on – once we found one – when they knew we were heading south (there’s only 2 options 🙂 ) – they would recommend their “friends” in the next town who would collect us from the bus drop off. Painless – and always ended up with a decent hotel for a fair price (negotiable of course). That’s good to hear, Lis! Sounds like it was definitely worth going back a second time. Having been once, I think I would probably feel confident to plan things on my own next time. But this worked best for me the first time around! I dunno, I’ve actually had some decent pho in the U.S. But yeah… all the Vietnamese food was better in Vietnam! Hi there! I just found your blog and yes, I would consider a tour to Vietnam. In fact, I went with Intrepid about 7 years ago and took their Vietnam Original Tour. I had a great time and we were a group of about 11 people I think, with myself as the only British person. I’ve been a solo traveller for years and it was just nice to have someone else do the work. I arrived in Hanoi via Moscow and spent a few days solo before flying to Saigon to meet the others. I then flew to Thailand solo aain after the trip, and spent a few days in Bangkok before flying back to Berlin. I had picked up a bug in the Aeroflot plane which I couldn’t get rid of and was ill the complete time that I was in Vietnam, so I was pretty glad that I didn’t have to sort all that out by myself LOL! Bummer that you were sick! I hate when that happens, but I have definitely been there, too. So glad to hear you enjoyed your Intrepid experience in Vietnam too, though! I’ll have to take a look at this tour. I’ve been on 5 trips with Intrepid so far and I think this one is going on my wish list, perhaps for next year. Do it! I really enjoyed it, and the price tag is great, too. Awesome to hear, Kat! It’s a great tour, and I’m glad to hear you’re considering it! We were exactly the same when we went to Turkey, wanting to do it by ourself but then we thought it would be easier with Intrepid- plus it gave us opportunities we couldn’t do on our own. Vietnam is very high on my travel list, and your video proved its place there! In some places, I think you really are better able to have unique experiences if you have a local guide. I definitely felt that way in Vietnam! Thanks so much for your detailed review. I am looking at this tour through Intrepid. I wanted to make sure the tour allows for downtime/solo time too, so excited about it. Your blog post has convinced me to seriously consider this tour. There are quite a few optional activities on this tour. If you choose to do them all, then that takes up a bit of your free time. However, it didn’t bother me much. It depends on your group, I guess – my group was always up for anything! We still had plenty of free time to explore most of the cities on our own, too, though. Thank you, Amanda for such a thorough review. I’m on my way to join this Intrepid tour today and would not have had the courage to take part in it if it wasn’t for you! That’s so great to hear, Kat! I hope you enjoy it as much as I did! I have just discovered your blog and its really amazing! I am considering the vietnam and cambodia tour next march. I am a 25 year old solo traveller, never been travelling by myself or anywhere near vietnam. I think the intrepid tour looks really good, just slightly nervous as Ive never done anything like this before. Everyone I talk to says I should just go it alone… and ‘don’t waste money on a tour’ but I really don’t know. Did you get enough time to see everything and have your own free time. And would you say tour is better for a newbie!! Thank you, and again your blog is amazing! Hey Emily! Listen to your gut – not what other people are telling you. Vietnam and Cambodia are not as easy for a first-time traveler as, say, Thailand might be. But even then you might feel more comfortable in a group, with someone else worrying about all the details for you. This tour was really great – I didn’t feel like we moved around too fast, and I definitely had enough free time to do/see all the things I wanted to. Great review!! It’s got me really excited for our trip in January. This will be my first time to Vietnam and Cambodia and also my first Intrepid tour. Would you have any suggestions on the type of luggage would be more suitable – a suitcase or would a backpack be more appropriate?? I hope you enjoy it as much as I did, Keira! I’m looking at booking this very trip for feb. 2015. Great to read your report and see you had such a great time. Sounds like just what I am looking for. I’m planning to arrive for the New Year celebration as well. Did you book online with Intrepid or over the phone? Not sure if there is a difference. Off to Read the rest of the posts from your trip. Hey Pete! Glad you’re considering this trip! I really did love it, and would highly recommend it to others! It doesn’t really matter if you book online or over the phone – Intrepid will take care of you either way! I don’t know how I stumbled on your blog but I sure am glad I did. Loved your review and will be following your blog from now on. You have inspired me into really visiting SE Asia and not just dreaming about it. Beautiful post Amanda very descriptive and also informative. The food was also amazing my tounge is tickling to taste those foods. Hi Amanda, I really enjoyed this blog post and note that your trip was paid for by Intrepid. You are a great saleswoman!! I am off on this trip in about 10 days and reading your posts and watching your video has helped add to the anticipation. Beautiful pictures too. Hope you don’t mind I’ve shared it on Facebook. 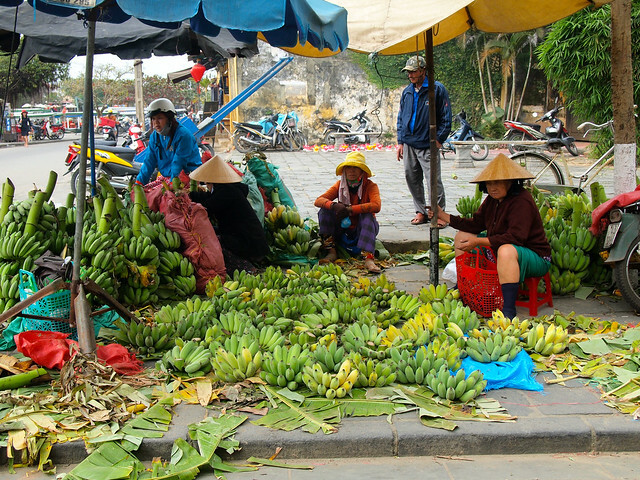 Did you try any of the bananas on your trip to Southeast Asia? Yes, I had bananas a couple times! They were indeed delicious. I also loved Vietnamese coffee! Thanks for this thorough review. I actually just did this tour last month, also as a solo female traveller, and I definitely concur with all your comments. Was an amazing trip for me and I would highly recommend it. I can’t believe all that I did in such a short period of time. If I were to organise it myself it would take a lot more planning. As well though as you mentioned I also had a great tour guide and fantastic company with my group (only 7 people) which made it that much more enjoyable. Great to hear that you enjoyed your trip, too! And yes, so much easier when you don’t have to do all the planning, especially when you’re traveling solo! I am so beyond excited to do this tour solo next August.I am also going to Cambodia and Thailand (Best of Vietnam and Cambodia). How much would you recommend on bringing for expenses? What air carrier did you fly on? Would you say that there are many young adults (early 20’s) on your trip? Ill only be 20 at the time of travel. Look forward to your response! I did a bigger trip in Southeast Asia, so I flew a variety of air carriers, including Turkish Airlines, Hong Kong Air, Thai Airways, and ANA. It all depends on where you’re flying from. And yes, Intrepid tours are usually a good mix of ages. There were a handful of people in their early 20s on my Vietnam/Cambodia trip. Hey, just stumbled across your blog, looking for some reviews and suggestions. 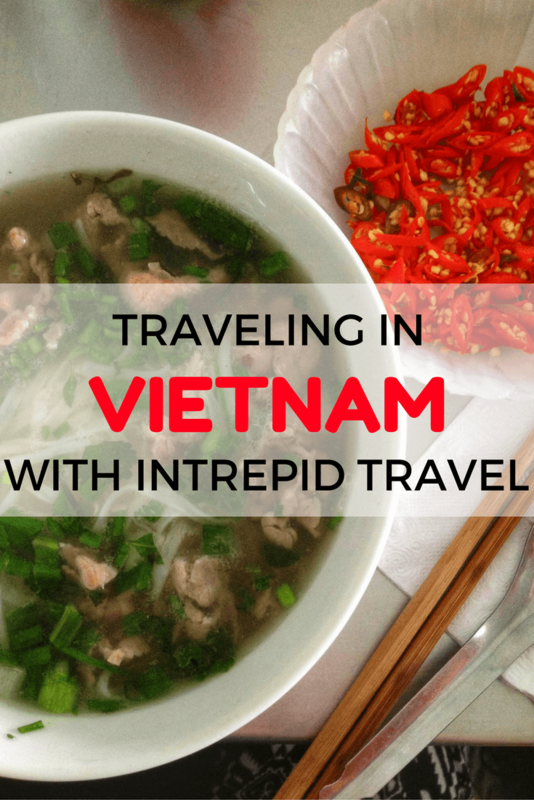 I’ve booked onto Intrepid’s Real Food Adventure – Vietnam, starting in Hanoi, going south to HCMC. Then onto the Cambodian Traveller tour, finishing up with a bite-sized break in Bangkok. I’ve been to Thailand twice before but as a tourist. This time, it’s my first time travelling solo, so thought it would be far safer, and more organised to go with Intrepid, who have a great reputation. The one thing I wanted answered has already been referred to earlier in the comments; luggage!! Rucksack or suitcase? It seems there’s a mix. 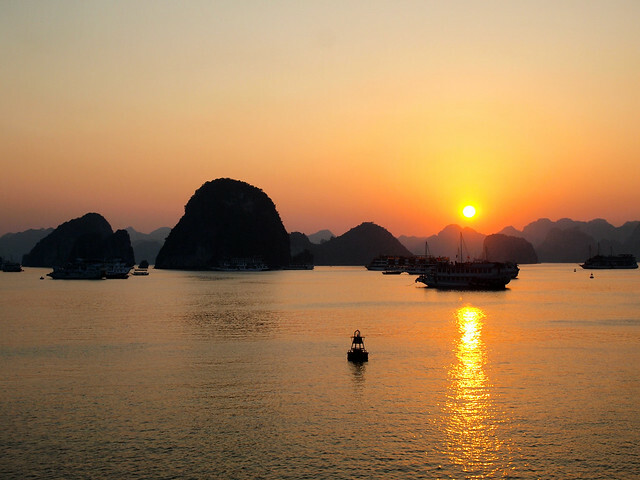 I was just worried about space when in the overnight train, on the boat in Ha Long Bay, and in the homestay. Have been researching wheeled backpacks, which come very highly recommended by seasoned travellers, but with an equally high price tag.. so I may just either bite the bullet and go for a decent sized rucksack (50 litres for a 3.5 week trip?) or get a wheeled duffle bag. Otherwise, am so excited. Only 17 days to go, but who’s counting!! I’m a bit late to the party, but in case anyone is googling and finds this useful- look very carefully through the trip notes to see about luggage- we took rucksacks to Sri Lanka as we figured that would be best but the luggage was rarely carried by us (!) and a wheeled bag would have been fine. We’re looking to book a different trip this time though and we’ll definitely need rucksacks as it specifically says you’ll be carrying your own bags a lot of the time. Enjoy! Great post! My 15YO daughter and I are taking the same Southbound trip with Intrepid next month (Feb. 2018). My daughter is adopted fro Vietnam (Saigon) and we haven’t been back since 2002 so it’s an extra special trip for us. Sounds like you had a GREAT time, and we’ve heard nothing but positive feedback about Intrepid. Happy travelling, and thanks again fro the fun post! I definitely had a great time and hope you guys do, too! Hi Amanda. 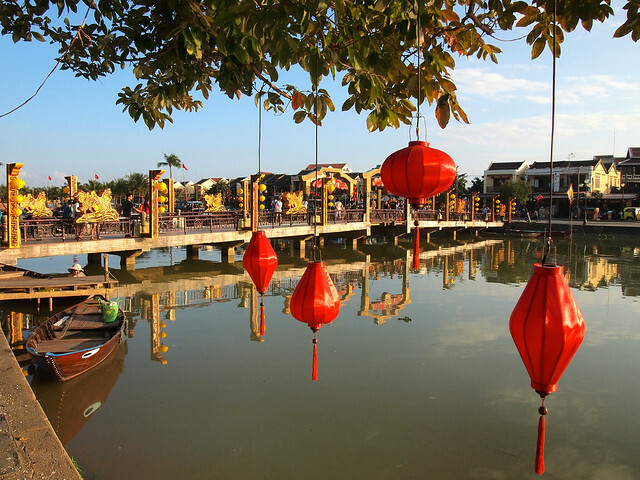 I have arrived at your blog as my daughter and I were researching tours to do in Vietnam. I love EVERYTHING you have posted here. All of it is very informative and helpful. This summer, I will be joining my 23 year-old daughter in Vietnam who is spending two month travelling through Europe and Southeast Asia. We booked the Intrepid Southbound trip. Although I consider myself a traveler (Europe and U.S.), this will be my first to SE Asia. At 52, I am not as adventuresome as I used to be. After reading a blog post on Intrepid Journal, I’m worried about whether I can handle the overnight train trip ( I take dramamine for motion sickness and use the bathroom frequently). Do you have any advice to make me less anxious? Thank you! Hey Whitney! You two will have a great time! This is a really good tour, and if you talk to your tour leader about your concerns, he/she should be able to give you some reassurance. The train trip isn’t really all that bad. Take your Dramamine and make sure you get a bottom bunk in case you have to get up during the night. And I would just bring your own toilet paper and hand sanitizer for the train restroom, which probably won’t be as clean as you’re used to! It’s only one night, though! Thank you for your quick response! Thanks for letting me know about the dramamine – I was wondering if I would need it on the train. Good point – only one night! Thanks for reassuring me. I mean, you might not need the Dramamine. But my motto is always “better safe than sorry” when it comes to motion sickness, so I’d probably just take it if you’re concerned! Anyway, I am really close to booking the same tour you did in Vietnam and just have some questions based on your experience. First, you mention a lot of optional bike rides on your trip, which look gorgeous but unfortunately I don’t ride a bike. (Big into hiking, just never learned to ride.) I can usually entertain myself well enough, but do you think I will feel really left out from the group based on your experience? Did everyone from your group go on all the optional bike rides? Second, did you take anti-malarial tablets? It seems like some people do and some don’t due to the side effects. As for your questions, all the bike rides were optional and not everyone in our group went on every ride. I’m sure if you let your guide know that you don’t ride a bike, he/she could come up with an alternative activity for you if you don’t want to figure things out on your own. And no, I didn’t take any anti-malarials in Southeast Asia. In Vietnam, they’re really only recommended if you’re going to super rural areas, and nowhere you go on this tour poses any high risk. Thanks so much! Can’t wait to hear about your future adventures on the blog!